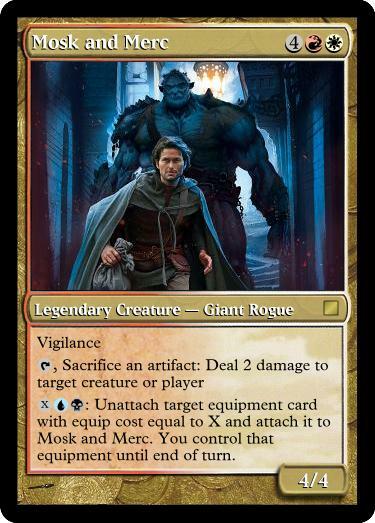 While I still think differently-colored activation costs are the secret tech that would make a 4-colored color-identity legend work the best, Innistrad block introduced some new tech — double-faced cards — that provide another option. Again, you only need 2-colors to cast it, but they’re better with 4. Some of these cards are my favorites, and a few need a bit more work. 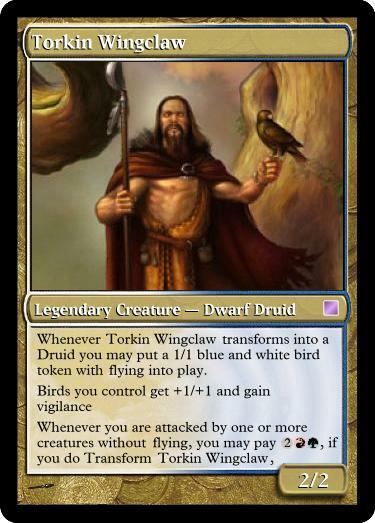 Torkin was partially inspired by Huntmaster of the Fells, and partially by Pikel Bouldershoulder (from R.A. Salvatore’s Cleric Quintet). 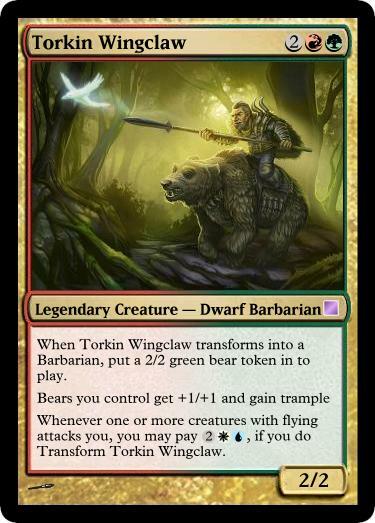 He’s a lord for the birds and the bears (that he makes), but he can switch back and forth depending on what you need defensively. 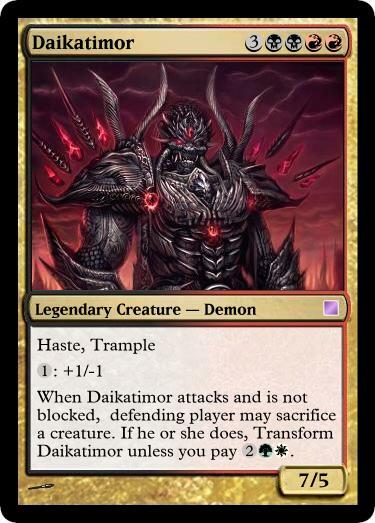 Daikatimor is a Rage Demon. He’s a pretty brutal beater, and a potential 2-turn clock. However, his transform condition (which I think might need to cost more), curses him into becoming an innocent young girl (just waiting for blood to be spilled to reawaken the Demon within), who also makes your team into great blockers (if pacifists). Dialda is a Knight who has studied tactical strategy, but she has some anger issues. 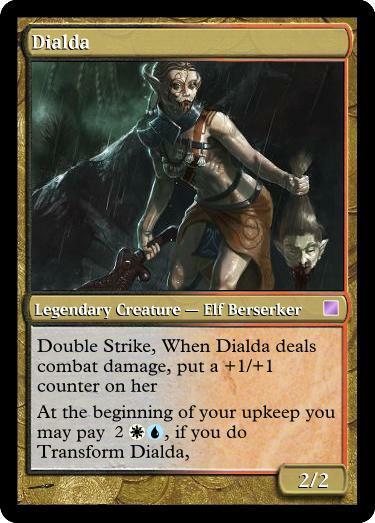 I wonder if the Double Strike side with the slith effect might be too attractive/powerful. I also think I’d use a less optional transform cost. Sure, Edric does the spying bit, but silly little court-maiden Gwynne does the dirty work. First she disarms you with her charm (and convinces you to give her gifts), but if you get in her way, or if you just need killing, she will eliminate you and then disappear in to the mists, leaving people none-the-wiser. I have a rule against Time-Travel… it’s confusing, and rarely done well. The baddass Mad Scientist speeds up time for you by giving you more cards… glimpses into the future… but if you pay the cost you get accidental rampaging dinosaur that eats time (preventing you from drawing cards, and requiring a sacrifice of hand), but also buys you time (more attack phases). 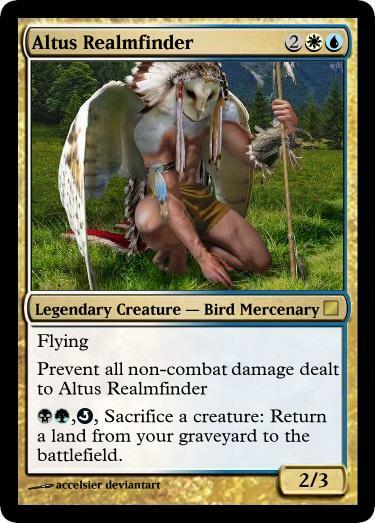 This was my second submission to the Commander Cast Contest. This one also didn’t win. This cycle starts at 2 mana for a 2/2 and ends at a 6/6 for 6. Each has an ability that has a major-effect on the game, where that effect is particularly stronger against the non-color, and can be built around in its own deck. I used Hybrid mana in the 2 and 3 cost creaures in order to technically have the colors in the mana costs. This makes them a bit easier to cast in the early game. Color identity prevents them from slotting into 2 or 3 color decks, and the hosing of a particular color strategy makes them less optimal in 5 color decks. 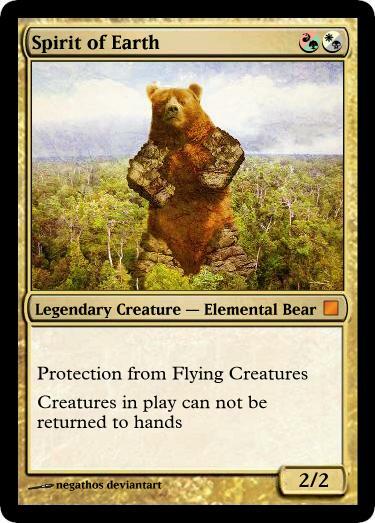 This guy’s name was originally “Gravity Bear.” He is not blue and prevents bounce strategies. Pro-Fliers doesn’t do much on defense, but he’s also only a 2-drop. 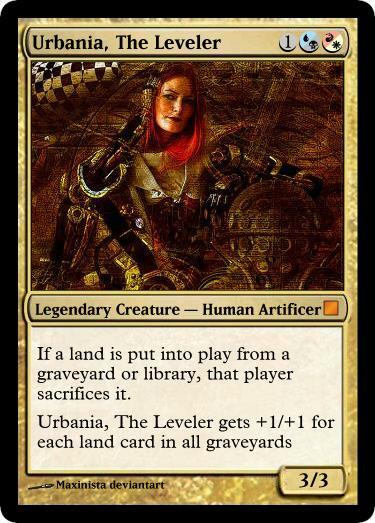 Urbania would like nothing more than to see gleaming spires, crowded streets, and even dingy alleyways cover her plane (can’t someone buy her a planeswalker ticket to Ravnica?). Her grand plan, and it is Her plan, involves clearcutting the wilderness and building and building. She sells it well, but few others notice how powerful she grows as her cityscape spreads. _design notes:_ This shuts down certain forms of ramp, which is one of the most annoying things about big green. It hits Primeval Titan [who was not banned at the time of the contest], fetch-lands, Oracle of Mul Daya, not Azusa though. At one point she also made you discard any non-drawn lands too, but I thought that was too much at this cost, and I wanted her to beable to come out early in the game to slow ramp. She hits your own ramp too OR if you ramp first (via fetches or artifact ramp) she’s bigger. Her red-ness also plays well with Land Destruction. The templating on this card is really poor. Astaia believes that the soul’s purpose is to serve on this plane, and that the only allowable death is a natural one (or at least an honorable one on the battlefield). _desgin notes_: There are sacrifice effects in all colors, but black has the most, and the most ability to cause others to sacrifice. 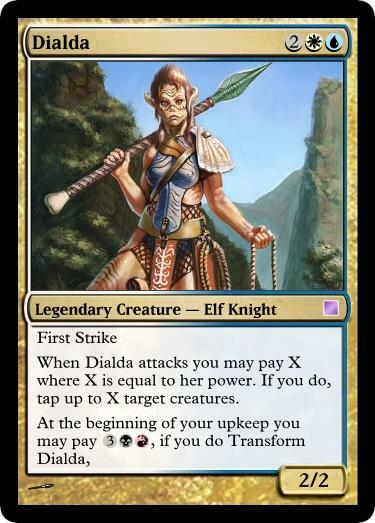 This is a pretty powerful effect in EDH. This card was created before Sigarda and before the other Angel that prevents sacrifices as costs. I think the symmetrical effect is more interesting. Anx’s webs capture the magical energies and vibrations, as well as the pain suffered by those around her, which she feasts upon. _design notes:_ Her main ability shuts down red direct-damage strategies. Reach is standard spider fare, but I didn’t want to break the cycle pattern and make her a 5/7. 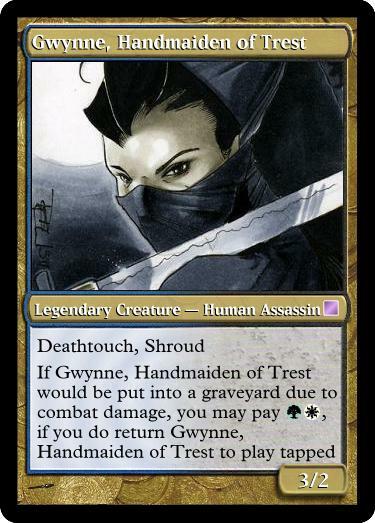 I thought about adding a triggered ability that caused her toughness to grow when she was targeted, but I decided Shroud was a simpler and less wordy choice. Shroud, not hexproof, because she’d rather eat the spells you’d send at her than allow them to affect her. 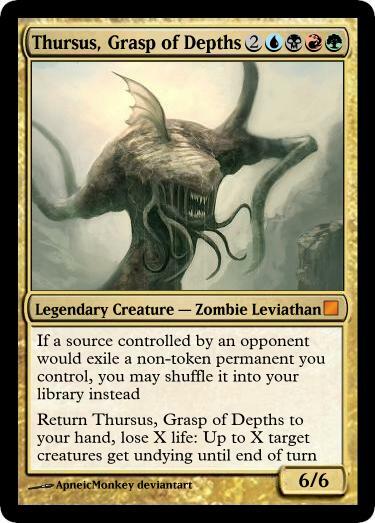 Thursus exists in the unfathomable void that lies beyond life, death, or the imagination. It’s empty there, and Thursus intends to keep it that way. It’s avatar emerges from the depths of the sea (or the mind). 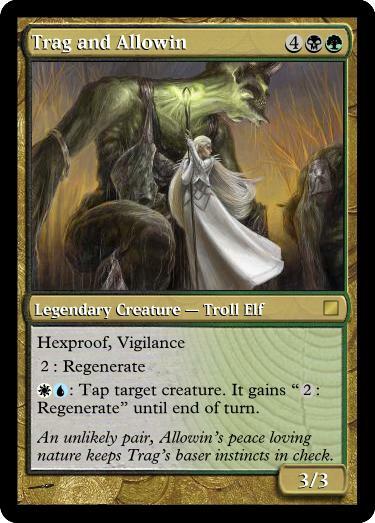 _design notes_: White has a lot of exile effects, and this card at least gives you the hope of getting the cards back. The second ability gives a degree of control against Wrath effects or other board-wipes. Note that it can give any player’s creature undying, so it can be used politically. The Return to Hand cost is meant to represent Thursus retreating into the player’s mind. It gives undying rather than indestructible because the latter feels more white. If X is 0, it’s a convenient way to bounce Thursus to your hand in response to targeting, and be able to recast it without extra General fees. I almost changed it to ‘avatar’ creature type, but I really wanted to make a UBRG Zombie deck. 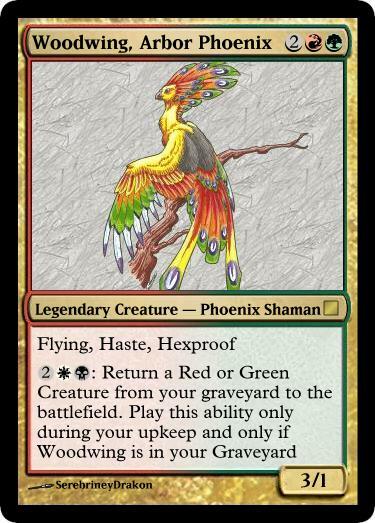 Card Creation: 4-Color Legends, part 1. 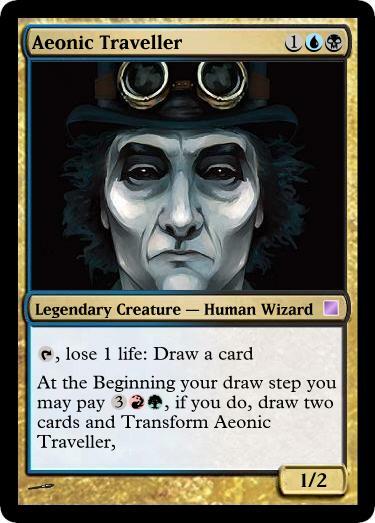 I’ve always been disappointed that there are no 4-color legends to build decks around. The nephilim are cool, they aren’t all super-inspiring as generals, so soon after I started playing EDH, I started creating 4-color generals. These are all cards that I think would be cool in the format. I haven’t built decks around them yet (my 4-color decks are tag-teams featuring real cards), but I plan on it this summer. 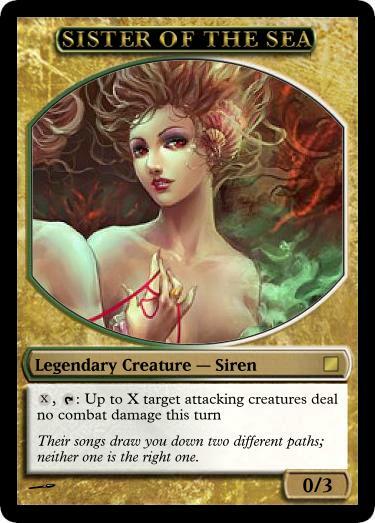 Since I won’t have as many opportunities to play over the summer, I thought I’d share some of my commander creations. 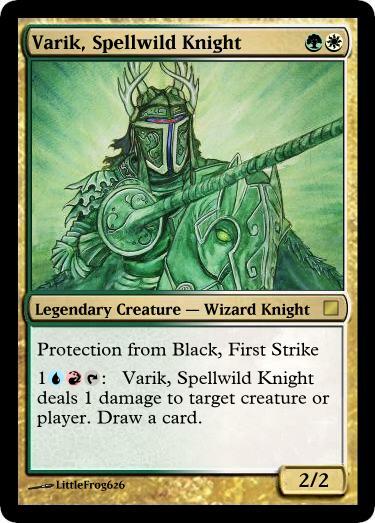 “I figured that one of the ways that 4-color legal generals could actually get printed in a regular set would be taking advantage of Color Identity rules. In non-commander magic, these would be playable and draftable in 2-color decks. 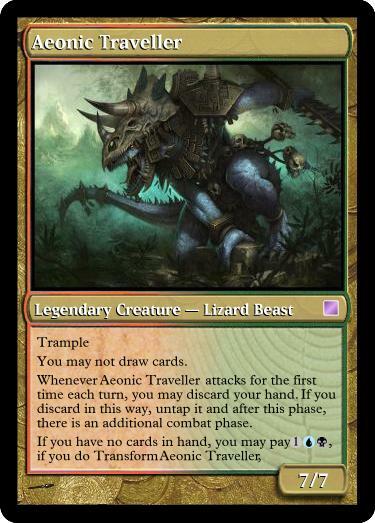 They’d be decent creatures that were made better if a player could manage to scrape together the off-color activation costs for their additional abilities. 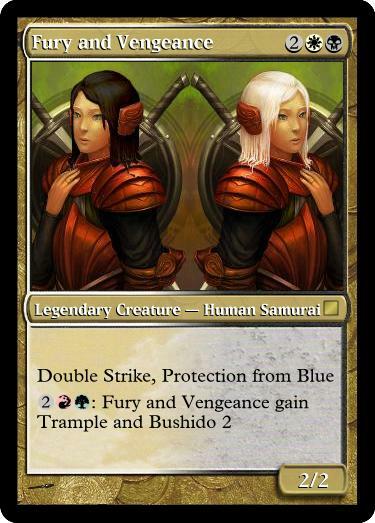 In commander, by the color identity rules, they’d only be playable in 4 or 5 color decks. 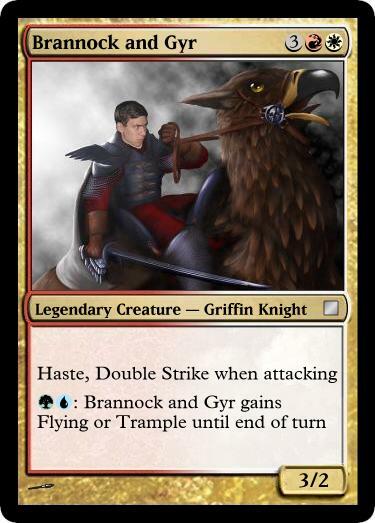 They’d still be relatively easy to cast, but would really shine with they additional abilities, AND they’d enable the 4 color deckbuilding that we currently lack. Once a nightwatch patrol on the walls of her city, dutifully protecting it from threats from the surrounding wilds. Kvasha’s failing one night allowed a woodland necromancer to temporarily take the city. 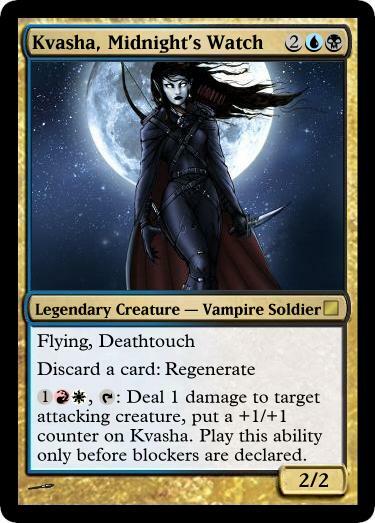 Kvasha was killed by undead beasts in the attack (which was ultimately resisted by the city’s militia). When she rose again the following night, her guilt compelled her to return to the walls (and skies) and defend the city. She slakes her vampiric thirst only on the enemies of the city, but she also draws strength from the dreams and fears of the inhabitants of her city. 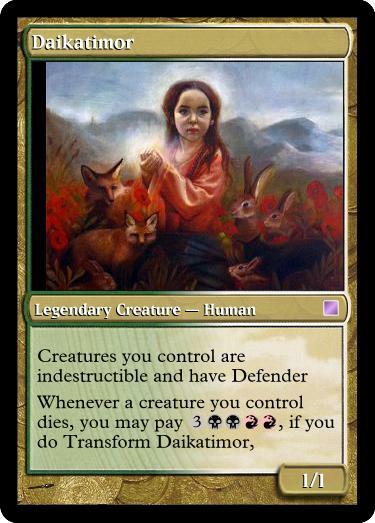 _Design notes_: I almost gave her Defender, but what fun is a commander that can’t go on offense just a little. I gave her a vampiric pumping ability as a RW combat trick (which is also relatively powerful because of the deathtouch). The before block declaration keeps her from being a constant 2-for-1 on defense). The discard-regenerate represents her blue side. Woodwing was nothing but a normal tropical bird until Vedalken artificers burned and clear-cut her forest to gain access to the magical ores beneath it. Woodwing rose from the ashes ready to exact vengeance and justice. Though her flame has been snuffed out many times, her power over life and death is strong enough to re-ignite not only her own soul, but also those of the other inhabitants of her forest. _design notes:_ GWB are graveyard recursion colors, with R having creature recursion in the form of phoneix cards. Hexproof comes from her G cost, and is helpful against blue’s targeted bounce. Her Graveyard recursion power is also resistant to countermagic. I like the idea that this is a commanderyou want to go to your Graveyard. 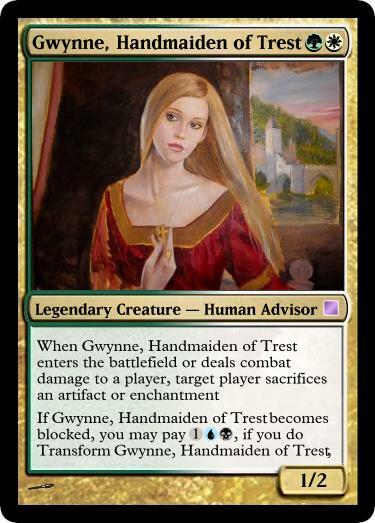 I limited her graveyard recursion to G/R for flavor reasons more than anything else. 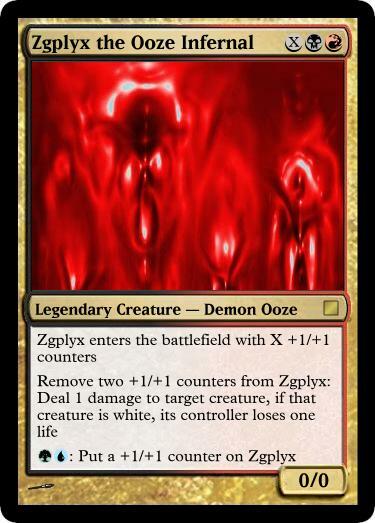 If the roilng, burning, engulfing, acidic chaos that is Zgplyx has an origin or motivation beyond the utter destruction of order, none have survived encounters with it with enough sanity (or life) to discover them. _design notes:_ Oozes are the best. So are +1/+1 counters. It’s a lot more fun with gross amounts of mana. Varik was a typical knight in the service of his king, when he discovered a latent talent for spellcasting. _design notes_: This was the first one I designed. He’s a standard Knight with a mini- electrolyze on a stick. Lost Civilizations, hidden temples, camoflauged enemy encampments… Altus Realmfinder will locate them. Many attribute his success to the piercing vision of his Owl-Aven eyes and his uncanny ability to evade harm, however, while this is true, what none-still-living know is that he also engages in blood magic to guide him (at great and secret cost to those who hire him). _Design Notes_: This card is effective versus Red for two reasons. 1. protection from non-combat damage means he can’t be bolted out of the sky by direct damage. 2. Land recursion softens the blow of Red’s targeted and mass land destruction. I didn’t want this to be a broken recursion engine, thus the additional sacrifice cost (which gives it it’s black feel). The Untap activation was added as a character trait. In order to find the lost realms, Altus has has to fly into the red-zone first. Or find some other way to tap.